First you learn that the Kyiv type 2 trident handstamps used on kopeck value stamps are horizontal clichés holding five Tridents and displaying sub-types a-b-c-d-e. Then you get told, ah, but single handstamps made from dismantled cliches were also used, so that instead of getting a-b-c-d-e on a row of 5 stamps you get a-a-a-a-a and so on through a very large number of possibilities (Bulat 257 - 581). In order to be sure that you are dealing with a single handstamp version of (say) sub-type "a", you need a pair or an example showing right-hand margin. Ideally, so that you can contrast them on a well-designed album page with regular five-Trident handstamps, you need a strip of five. To be honest, I have never met one collector who gets enthusiastic about these stamps. If you are a serious Trident collector, you have to do them as part of your duty. That's about it. They are hard work to identify, in many cases hard work to find, and they don't look that different to regular 5 - Trident material, except that they usually jump about across the horizontal row of stamps as in the example shown above. This is Kyiv 2ee (just to complicate matters, a sub-type of a sub-type) on 4 kopeck imperforate, Bulat # 400, catalogued $8 (Dr Seichter catalogued 15 DM). 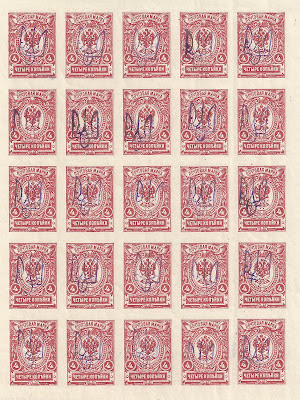 For twenty years, I have dedicated a 48 page stockbook to these Single Handstamp varieties. The contrast between relatively common stamps and the scarcer ones is striking - my stockbook now contains mainly the common stamps, often in multiples. Some of these are remainders from my very first Trident purchase. 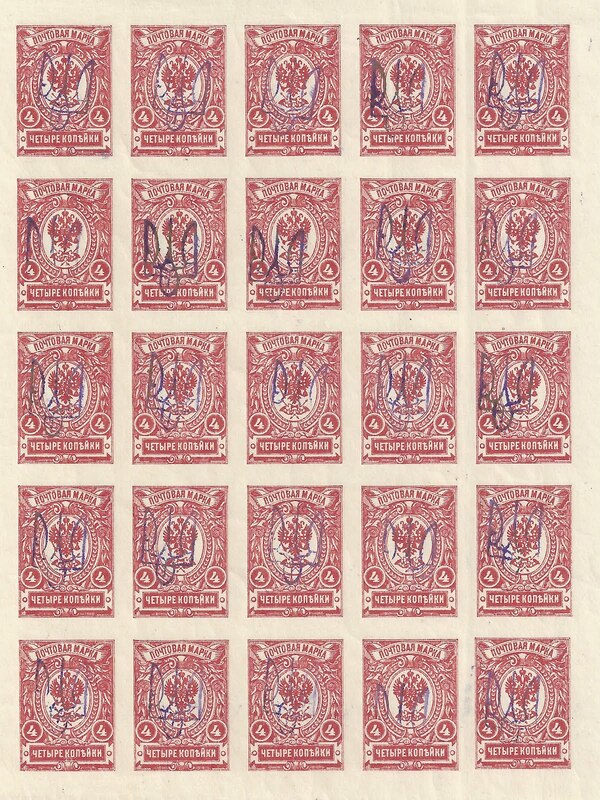 The nice auction house of Schwanke in Hamburg offered for sale early in the 1990s some 30,000 Trident stamps in complete sheets, folded once but otherwise in very nice condition, and among which were some sheets with single handstamps (already identified by the previous owner). I think I paid a few thousand Deutschmarks for the whole lot. There was a time when I thought I would never sell all these stamps, but the sheets of the regular stamps have all gone by now and only some of the single handstamp material remains.